A Libyan In Tunis: A Refugee's Story : The Two-Way One of Libya's first citizen journalists tells the story of his escape to Tunisia and the two months he was forced to spend offline, causing many of his online contacts to fear he was dead. It was almost as if he had come back from the dead. In early March, a Tripoli resident who goes by the name of @abukhir on Twitter, disappeared from the Internet. For two weeks prior to that, before western journalists arrived in Libya, @abukhir had provided some of the most riveting citizen journalism to come out of the country. He uploaded photos of people making Molotov cocktails and military helicopters flying overhead. At one point, he even live-tweeted and recorded video of a shoot-out that happened outside his house, leaving bullet holes in his wall. 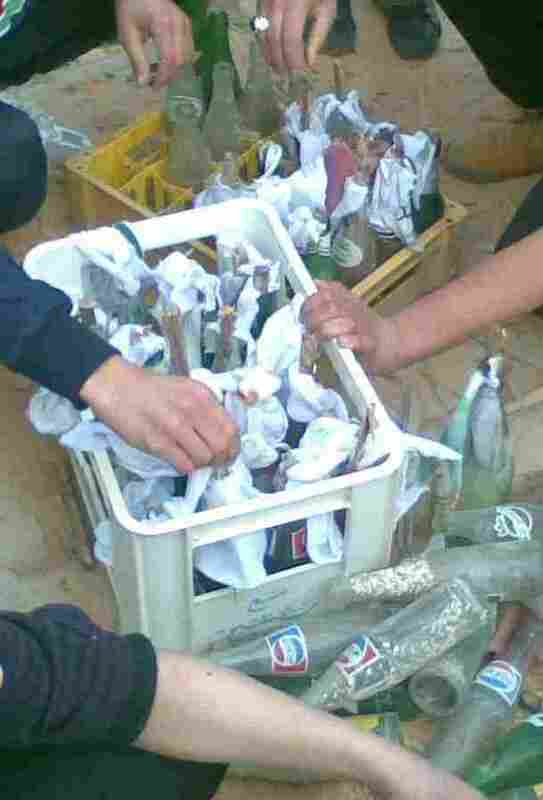 A group of Libyans make Molotov cocktails in Tripoli. "Oh god gun shots...bomb guys i heard bomb alot of gun shot please help," he tweeted. "Allah help me... Oh God.... Boomb... i have to go off now to think about my life." Like other Twitter users in Tripoli, he didn't use his real name, out of fear of reprisals by the government. He even changes his name occasionally as a precaution. So when the Gaddafi regime shut off Internet access in western Libya, @abukhir shut off as well. For two months, people on Twitter speculated what had happened to him. At best, he and other Tripoli citizen journalists were just offline. At worst... well, no one wanted to contemplate the worst. His last tweet on March 3 didn't bode well: "What should we do?" he wrote. And then on May 3, two months after his disappearance, @abukhir reappeared on Twitter. For the most part he was cryptic about what had happened to him, but he implied he was out of Libya. "I have alot to say but i'll be back later," he wrote that day. This afternoon, though, he agreed to sit down with me via Skype and talk about his odyssey. As it turned out, he was indeed out of Libya, sitting at an Internet café in Tunis — he hadn't been able to bring his laptop with him. When I asked him how on earth he managed to get out Libya, his answer was straightforward. "I have a second nationality," @abukhir explained. "They couldn't stop me at the borders." That's not to say the journey was easy; @abukhir said he had to pass through around 20 army checkpoints between Tripoli and the border crossing. Because of his dual nationality, he knew it would be easier for him than many others to get out of the country. But one of his biggest fears was that they'd scrutinize his papers and discover his place of birth: the U.S. And that could cause him major problems, depending whom he encountered. His fear of his birthplace being discovered was one of the primary reasons he left Libya. But there was more to it than that. "I got out because I couldn't handle it," he told me. One of his friends had been kidnapped by Gadhafi forces in late April and hasn't been heard from since. And though it was relatively safe to go out in daylight, after dark was a whole other matter. "In the night, everything goes crazy," @abukhir explained. He also added that small groups of anti-Gadhafi guerillas would go out at night and then disperse quickly — something that has been reported increasingly over the last week by other sources and news organizations. "People in Tripoli are just waiting," he said. "They cannot do anything. There's not Internet, no SMS." Prices of basic goods, like cigarettes and cooking oil, had doubled or tripled in recent weeks. Last week, @abukhir took what he could carry and made his way to the closest border crossing with Tunisia. Now he's in Tunis, which he says is full of other Libyan refugees. "I feel like I'm in Libya here," he said. "Everyone has his story to tell." @abukhir is among the lucky ones. According to the Libyan opposition administration, the Transitional National Council, as many as half a million people have fled the country, with tens of thousands of them forced to live in tent cities stretched along the Tunisian side of the border. For now, @abukhir is able to stay with extended family in Tunis, and his French employer is trying to help him find ways of working from there. And on those occasions when he's able to watch Libyan state TV, he's seen repeated messages imploring Libyans in Tunisia to return home, with a guarantee of their safety. "Gadhafi TV wants us all to go back," he said, laughing at the prospect. "Do you believe that even now, I don't have a clear mind," @abukhir added. Nonetheless, he tries to remain positive about the situation back home. "I think it's going to end soon." Andy Carvin (@acarvin) is senior strategist for social media at NPR. He's been covering the Arab Spring since December.